“I don’t concede anything,” an animated, feisty but at times professorial, governor said to a roundtable of more than two dozen local African-American business owners and community leaders — at Triton Seafood, a township minority-owned business. They gathered to express their support for Corbett’s reelection bid, and let him know that there are strong reasons for minority voters to back him in November. The more than one-hour long session was a chapter-and-verse defense of the decisions he’s made as governor and the reasoning behind them — and even he admitted at times he was getting back to his roots as a teacher, in walking through what happened and why, all the while working to make his case for another four years. Corbett also announced that Chester County Commissioner Terence Farrell would chair African-Americans for Corbett-Cawley. Gov. 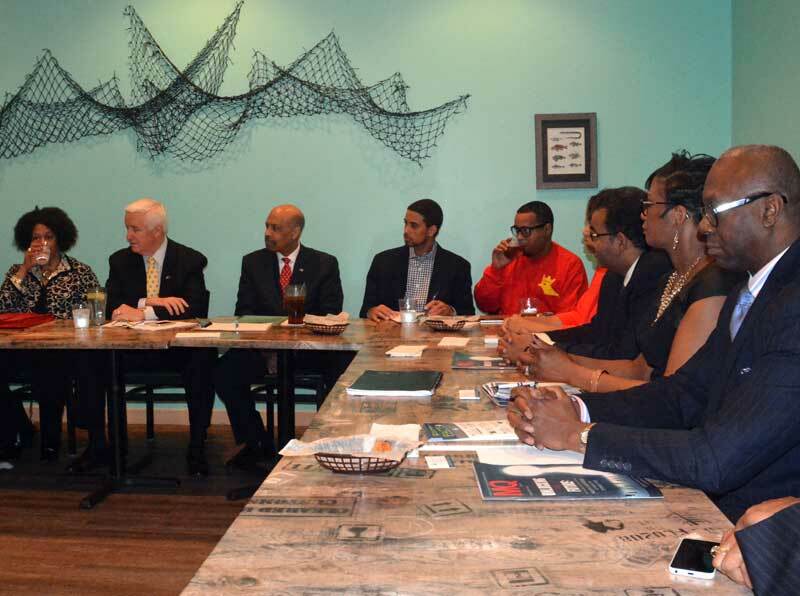 Tom Corbett listens to concerns of local African-American business leaders during Wednesday’s roundtable. Seated next to the governor is Chester County Commissioner Terence Farrell who will chair the statewide African Americans for Corbett-Cawley Leadership, as part of the governor’s reelection campaign. He talked about the situation he inherited from former Gov. Ed Rendell, noting his predecessor left behind a more than $4 billion budget deficit and had been using Federal stimulus funds to pay for operating expenses of the state — and when they dried up, the budget deficit went from bad to worse. 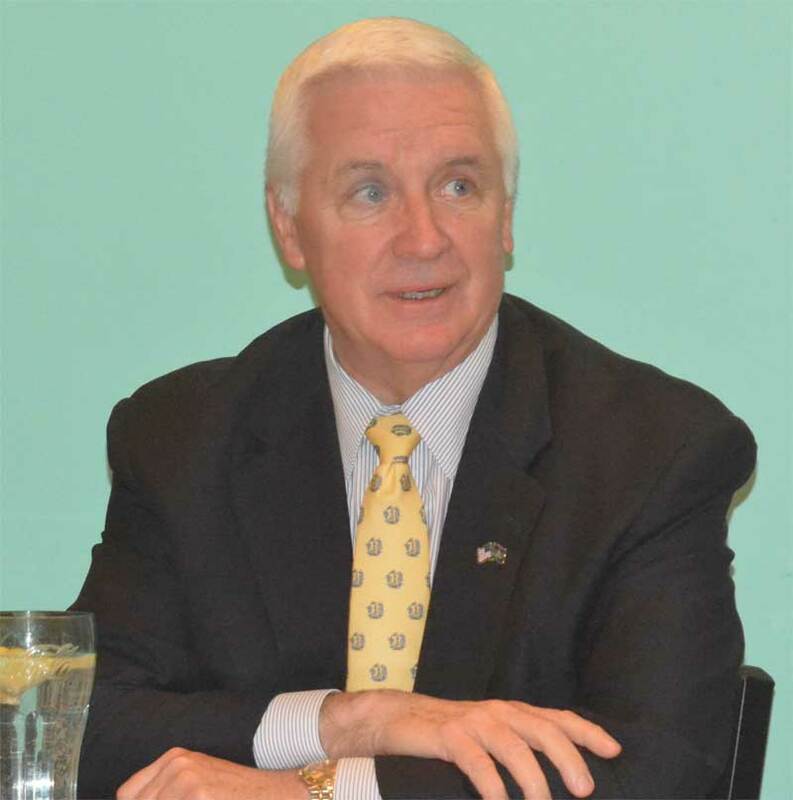 Corbett talked about attacking the problem the same way small business owners would, looking for where costs could be taken out of government, while holding the line on taxes, he said. he talked about thinning the state vehicle fleet, closing down unneeded print shops and looking for underuse and redundancy. He also talking about getting state employees to make suggestions about ways to cut costs and make state government for efficient. Those cuts and others — Corbett said it’s not fair to call his education spending, which he notes is the highest in state history, a cut because the state was unable to make up for federal stimulus funds — have not exactly left him as the most popular governor in state history. And because of the way the state spends money — the options he had were very limited without raising taxes. Corbett said that about 40% of the budget goes to education, just about 39% goes to welfare, Medicare, social services and similar human service needs. Corrections and debt service eat up another 10% of the budget. That leaves just 10% to work with. “The rest of the state government comes from that 10%,” he said, which doesn’t leave much to work with, he explained, when you have a budget shortfall. While the state doesn’t have a severance tax, there are multiple other taxes being paid — totaling, he said almost $2 billion over the last five years, not including impact fees, which he said total some $640 million over the past three years. Because of the competitive nature of the business — and multiple states with gas deposits — Corbett said that Pennsylvania has to be cost-effective, or gas producers will leave the state. “We’re fighting for the (drill) rigs,” he said, as while gas is plentiful, the number of drilling platforms for it is limited and gas companies will take those rigs to where they get the best return on investment. The governor said that there has been so much confusion and at time misrepresentation, he wishes he could sit down with every state resident and explain it, so people would understand. He moved on to topics related to small business, such as his efforts to cut the inheritance tax for small businesses and farmers — noting the latter had the added benefit of reducing development, as less farm families are forced to sell out to housing developers. He also addressed his efforts to privatize liquor sales in the state — a fight which remains stalled in the legislature. He chalked that up to the state’s historic resistance to change at times, not the details or the concept of the various privatization plans that have worked their way through the state house only to come up short. “We’re still doing things the way we did in the 1930s,” he said — and losing somewhere between $60 and $80 million in taxes lost to alcohol purchased in neighboring states. “Let’s get into the 21st Century,” he said. As the hour closed, he turned to discuss jobs, not just how to create them, but how to make sure workers are prepared for the needs of this century. With a looming shortage of tradesmen — plumbers, carpenters and electricians — more focus should be placed on identifying those students would be best suited to careers in those fields — and not just assuming all students should be college-bound.